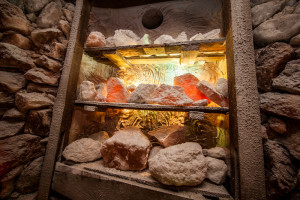 Many health troubles are beneficially treated by staying in the salt cave. The secret of healing in the salt cave is simple. The air in it is saturated with salt and many minerals and trace elements contained in it. By staying in the cave, elements essential for the proper functioning of an organism get absorbed into it.A body thus gets into balance and begins to heal by itself; because it is only man alone, who can heal himself. All the rest, such as medicine, only serves to supports and aid the body in its self-healing. Sodium has influence on functionality of the heart and on optimal blood pressure, improves condition of the skin. Together with chlorine it forms ordinary salt which keeps acidity and alkaline balance in organism and it’s essential for proper function of kidney. Potassium has a positive influence on functionality of the heart and makes the blood supply to the skin better. It lowers blood pressure, prevents heart diseases, improves functions of the skin, has diuretic activity, and helps in clearing poisonous products of metabolism. Magnesium is an anti-stress element. It influences the heart and vascular system in a positive way. It soothes asthma attacks and chronic tiredness, lowers nervous tension, protects from heart diseases and lowers high blood pressure. Calcium strengthens immunity of our organism, soothes vexation and regulates functioning of blood-vascular system. It is the timber of the bone system, builds up immunity, helps people suffering from hypertension to lower blood pressure and it has anti-allergic values. Iron is an essential element of hemoglobin. It cures anemia, influences work of the muscles, improves concentration, and lowers subjection to infections. Bromine lowers blood pressure and regulates functionality of the nervous system. Iodine is responsible for the proper functionality of the thyroid, which manages our metabolic rate, growth, development and regulates weight. The scientists describing the influence of the atmosphere in the salt cave on human organisms agree that it naturally activates neurosecretive system of the hypothalamus and adrenal cortex similarly to extended steroid therapy with one exception – the lack of side effects. 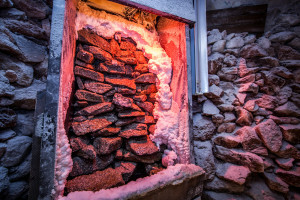 Staying in the salt cave is an effective method of treatment for chronic respiratory diseases, working well with or without medical treatment and without any known side effects. Even pregnant women with asthma or other respiratory diseases could use this therapy without any harm to the child. Salt crystal stones produce the air saturated with negative ions which are crucial for a healthy body and bring joy and love into our heart and life. Due to the fast growth of technology and environmental pollution, more and more people suffer from allergies, asthma and civilization diseases. Outside air in cities and even mountain microclimate are weak in iodine and other elements important for our health. Dust, cigarette fumes, our modern convenient electrical appliances, such TVs, computers, high-voltage networks and external pollution produce large quantities of positive ions creating electrical imbalance in the air. When negative ion concentration is lowered, and people inhale more positive ions from the air, it can cause headaches, lethargy, dizziness, nausea, depression, indigestion, and irritability. It is extremely important to add this precious element, negative ions, back into the air for optimal health. The concentration of negative ions is naturally higher around waterfalls and by the ocean; when water droplets are dispersed, an electrical charge is created. The concentration of light ions in the mountains is 20 times higher than in the cities. The antibacterial influence of negative ions in the air has been proven in the hospitals by increasing the concentration of negative ions in the air. The percentage of harmful bacteria in the air was significantly lowered causing patient‘s wounds to heal faster and convalescence of the patients was shorter. People who were exposed to higher levels of negative ions in the air indicated these positive results: achieving optimal weight, decrease of blood pressure, increase of energy and stamina. But take heed, even the salt cave is not cure-all! For acute infectious illness with fever like influenza, cold, angina, bronchial tube inflammation, tuberculosis, and so on, it’s better to keep out of a cave. But immediately after getting rid of fever, visiting the salt cave is the best way for final treatment. Staying in a salt cave is not beneficial for people with hyperthyroidism. Visiting a salt cave is also not suitable in case of ontological diseases. On the other hand, it’s recommended after chemotherapy.